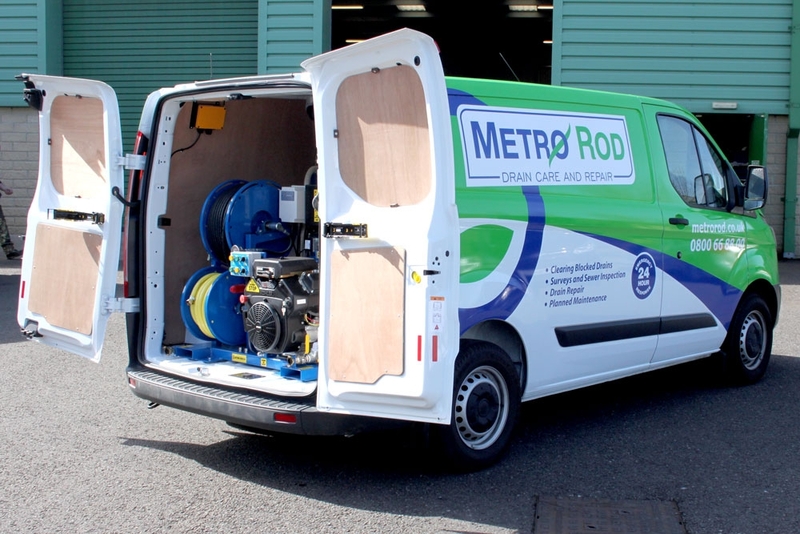 Metro Rod services are provided throughout the UK by over 40 franchisees. Specialising in reactive drain clearance and maintenance services on a 24/7/365 basis, individual franchises serve local and national business customers across multiple sectors, as well as public sector and domestic customers. Roy Dean bought the Metro Rod (Chester) franchise in 2012 after a career in landscaping and construction. The company now operates a fleet of seven jetter van-pack units, two combination units and a range of support vehicles. One of Metro Rod’s larger franchises, the business has grown over the past six years and now employs 15 full-time staff. Its areas of operation include The Wirral, Chester and much of North Wales. Individual franchisees are supported by a centralised team based in Cheshire but have autonomy when it comes to the equipment they operate. There is also a responsibility to buy and maintain equipment that complies with the company’s strict health and safety, environment, and quality policies. The 1-Series was launched in 2017 and features an efficient 23.5HP OHV petrol engine, selected because of its high performance and low emission credentials. The unit uniquely includes an electronic control panel that eliminates the need for traditional operation levers. Developed to enhance user operation, the new electrical system also means that upgrading to a remote control for single-man operation can be carried out at a fraction of the cost of traditional systems. In compliance with EU manufacturing directives, machine safety formed a key aspect of the design process. Unusually for machines in this price range, the 1 Series includes fail-safe features such as automatic HP pump protection and engine revs reset. And although the smallest capacity machine in the V-Pack range it features a comprehensive specification including large capacity jetting and filling reels, unloader valve system and anti-freeze valve as standard. Jon Woods, UK Sales Manager for Andy Guest Jetters, says they have been working with Metro Rod franchises throughout the UK over several years: “Our range of van-pack jetters has proved very popular with Metro Rod franchisees, and we’ve sold a large number of units across the group. Bespoke van conversion work includes the installation of central bulkheads, front section shelving, tube carriers, storage, lighting, and welfare equipment. Jon Woods says it’s all part of Andy Guest Jetters’ commitment to provide turnkey services for clients of all sizes. Metro Rod (Chester) are currently trialling the new 1 Series jetter to see how it performs in day-to-day operations, and the company has plans to purchase more units in the future. In 2019 new EU-wide emissions legislation will come into force, meaning that new diesel engine jetters will be subject to much more stringent emissions control. As a petrol-engine unit, the 1 Series is not subject to the new rules and offers a viable lightweight, high-performance option.